The mint julep, a cocktail made from a mixture of bourbon, powdered sugar, water and mint, is often associated with horse racing. It has been the official drink of the Kentucky Derby for almost a century; according to the website of the annual event, nearly 120,000 juleps are sold at Churchill Downs over the two-day race period. 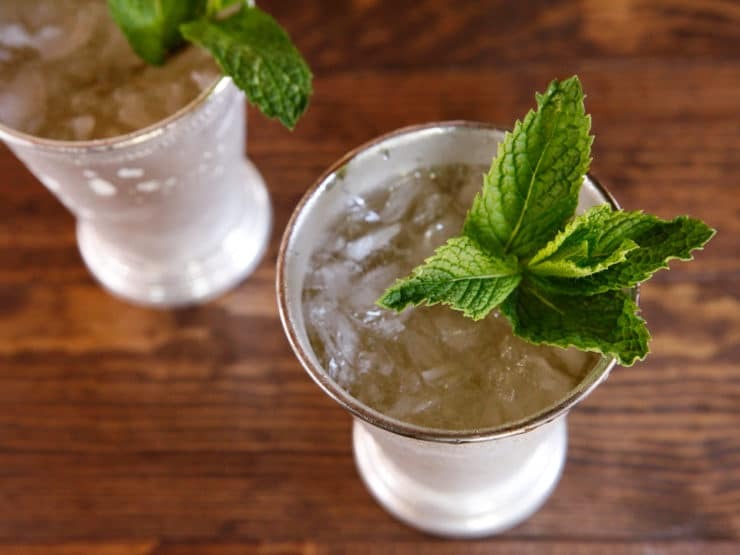 Like most recipes that come from the South, mint juleps have a long and often debated history. It’s widely believed that the name of the drink comes from the Persian word gulab and the Arab word julab, both of which translate to “rosewater.” The term julep was also used to refer to any type of syrupy mixed drink taken with medicine. As early as 1784, mint juleps were prescribed to soothe aching stomachs and help patients who had difficulty swallowing. A legend claims that the mint julep arrived in America when a man was searching near the Mississippi River for water to add to his bourbon. When he saw mint growing wild, he decided to drop a few leaves into his libation—ta da! Mint julep. 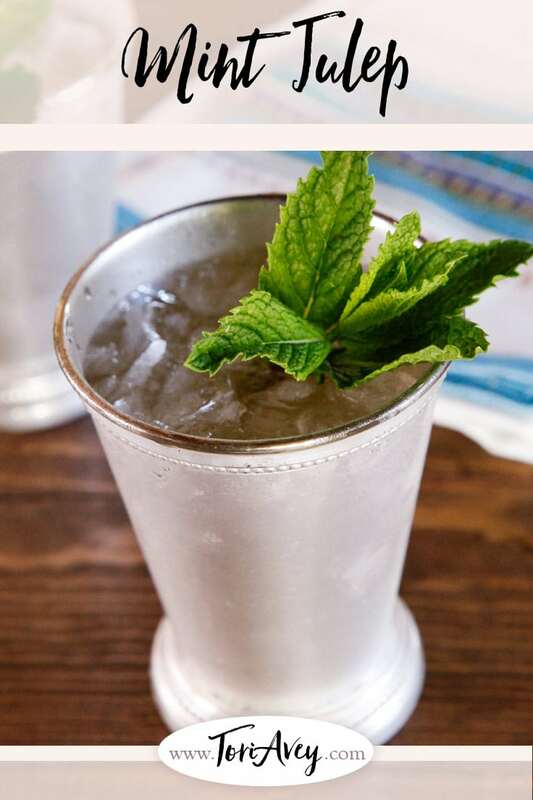 This is almost certainly a wives’ tale, or as my friend Gil Marks called it, a bubbe meise; most historians agree that the mint julep was developed within Virginia high society during the late 1700s or early 1800s. In its early days Virginians would sip on mint juleps, served in silver goblets, over breakfast. During this time they were made with brandy or rum. Some say bourbon, which was readily available, was introduced to the julep by poor Southerners who could not afford fine liquor. To this day, many enthusiasts insist that a proper julep should be made only with bourbon whiskey. Given that Bourbon County is the birthplace of bourbon whiskey, there is also a strong connection between the mint julep and the state of Kentucky. 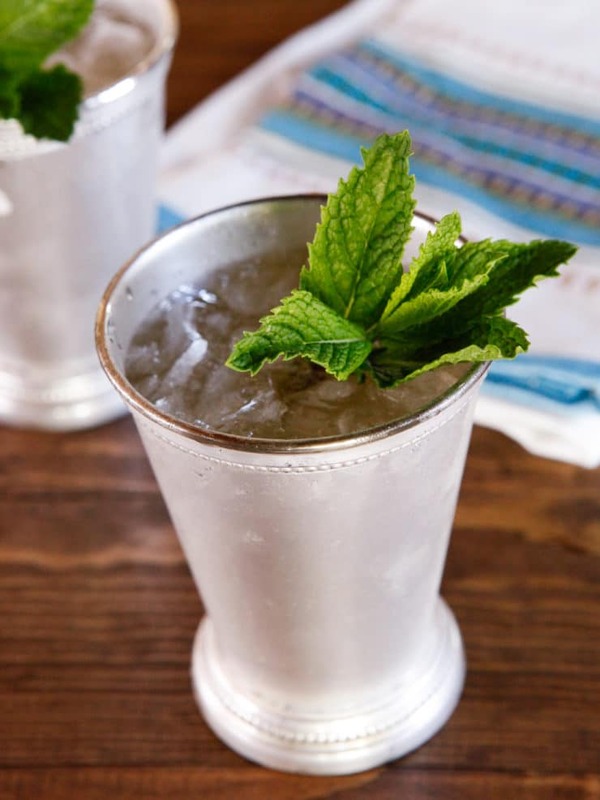 As early as 1816, silver julep cups were offered as prizes at Kentucky county fairs, early evidence of the state’s association with the famous cocktail. 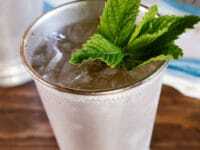 It’s unclear how exactly the mint julep became the star drink of the Kentucky Derby in 1938, but it comes as no surprise that this bourbon-centric cocktail is now celebrated as the beverage of choice at the state’s most famous event. How the mint julep is made varies slightly from place to place and bartender to bartender. There is some controversy as to whether the mint leaves should be delicately mixed in or muddled to release a stronger flavor. And then, of course, there’s the whiskey question—must one really use bourbon to make a true mint julep? Minor quibbles aside, it’s no wonder that the mint julep rose to popularity in the South. What could be more refreshing than an iced mint beverage on a humid, sweltering summer day? This requires the best of everything if you would have it in perfection. Especially the mint and the whiskey or brandy. Choose tender, quick-grown mint, leafy, not long-stalked and coarse, wash it very clean, taking care not to bruise it in the least, and lay in a clean cloth upon ice. Chill the spirits likewise. Put the sugar and water in a clean fruit jar, and set on ice. Do this at least six hours before serving so the sugar shall be fully dissolved. Four lumps to the large goblet is about right—with half a gobletful of fresh cold water. At serving time, rub a zest of lemon around the rim of each goblet—the goblets must be well chilled—then half fill with the dissolved sugar, add a tablespoonful of cracked ice, and stand sprigs of mint thickly all around the rim. Set the goblets in the tray, then fill up with whiskey or brandy or both, mixed—the mixture is best with brands that blend smoothly. Drop in the middle a fresh ripe strawberry, or cherry, or slice of red peach, and serve at once. Fruit can be left out without harm to flavor—it is mainly for the satisfaction of the eye. But never by any chance bruise the mint—it will give an acrid flavor “most tolerable and not to be endured.” To get the real old-time effect, serve with spoons in the goblets rather than straws. In dipping and sipping more of the mint-essence comes out—beside the clinking of the spoons is nearly as refreshing as the tinkle of the ice. If you visit Churchill Downs for the Kentucky Derby and order a mint julep, you’ll receive a ready-to-serve cocktail made with Early Times Kentucky Whiskey, the official supplier of the cocktail for over 18 years. If you’re feeling extra fancy (and charitable), you can order The Woodford Reserve $1,000 Mint Julep Cup, made with specially sourced exotic ingredients and served in a silver julep cup with a gold plated straw. Each year the net proceeds are donated to a different charitable organization. The 2014 Derby was named “The Run For The Roses,” which inspired Woodford Reserve to create a julep with rosewater-infused ice and candied rose petals. I like to think it may have also been a nod to the julep’s early origins. This year, the Kentucky Derby takes place on May 6 and 7. Thinking of hosting your own viewing party, complete with homemade mint juleps? Try the official Mint Julep recipe from Churchill Downs here. Or try this Mint Julep Ice Cream recipe (brilliant right?) from my friend Garrett McCord on Simple Recipes! Ayto, John, and John Ayto. An A-Z of Food and Drink. Oxford: Oxford UP, 2002. Print. Carson, Gerald. The Social History of Bourbon, an Unhurried Account of Our Star Spangled American Drink. New York: Dodd, Mead, 1963. Print. Harwell, Richard Barksdale. The Mint Julep. Charlottesville: U of Virginia, 1975. Print. Johnson, Joseph. Medical Communications. Vol. 1. N.p. : Society for Promoting Medical Knowledge, 1784. Print. McCulloch-Williams, Martha. 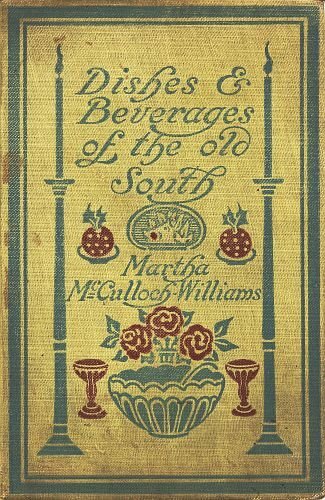 Dishes & Beverages of the Old South. New York: McBride Nast, 1913 n.d. Web. Project Gutenberg 08 Apr. 2015. “Mint Julep.” Kentucky Derby. Churchill Downs Incorporated, n.d. Web. 08 Apr. 2015. Siemens, Shannan. “The Kentucky Derby’s $1,000 Mint Julep.” CNBC. CNBC, LLC, 14 Apr. 2014. Web. 08 Apr. 2015. Smith, J. Soule. The Mint Julep, the Very Dream of Drinks: From the Old Receipt of Soule Smith, down in Lexington, Ky. Lexington, KY: Gravesend, 1949. Print. My wife and I met almost 30 years ago over mint juleps at a Derby party. I am Kentuckian born and bred and so relish the tradition on juleps on Derby Day. Each year since, we commemorate our meeting by toasting it with juleps served in silver Kentucky Colonel julep cups. I would like to see a non alcohol “mint Julip” come out of this for those of us to detest alcohol but love mint! !